From the Department of Pathology (I.C., M.C.M., P.G. ), Case Western University, Cleveland, OH; Department of Neurology (K.Q., F.M., C.G., A.S., L.Z., J.A.M. ), University of Chicago; and Department of Biological Sciences (E.N. ), DePaul University, Chicago, IL. Objective To describe the clinicopathologic, molecular, and transmissible characteristics of genetic prion disease in a young man carrying the PRNP-G114V variant. Methods We performed genetic, histologic, and molecular studies, combined with in vivo transmission studies and in vitro replication studies, to characterize this genetic prion disease. Results A 24-year-old American man of Polish descent developed progressive dementia, aphasia, and ataxia, leading to his death 5 years later. Histologic features included widespread spongiform degeneration, gliosis, and infrequent PrP plaque-like deposits within the cerebellum and putamen, best classifying this as a Creutzfeldt-Jakob disease (CJD) subtype. Molecular typing of proteinase K-resistant PrP (resPrPSc) revealed a mixture of type 1 (∼21 kDa) and type 2 (∼19 kDa) conformations with only 2, rather than the usual 3, PrPSc glycoforms. Brain homogenates from the proband failed to transmit prion disease to transgenic Tg(HuPrP) mice that overexpress human PrP and are typically susceptible to sporadic and genetic forms of CJD. 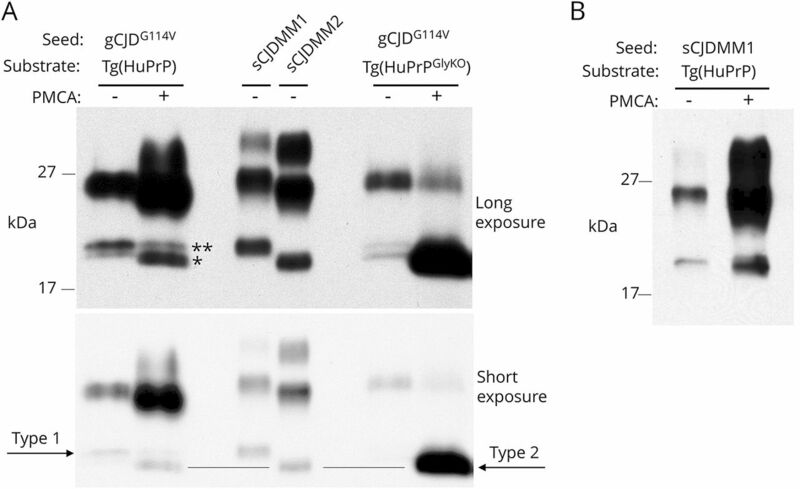 When subjected to protein misfolding cyclic amplification, the PrPSc type 2 (∼19 kDa) was selectively amplified. Conclusions The features of genetic CJDG114V suggest that residue 114 within the highly conserved palindromic region (113-AGAAAAGA-120) plays an important role in prion conformation and propagation. Approximately 10% of prion diseases result from an autosomal dominant sequence change within the coding segment of the PRNP gene.2 A single nucleotide change within codon 114, resulting in a valine (V) substitution of glycine (G), has been reported in a family from China8 and Uruguay.9 We report an American case and his father. Several features of gCJDG114V, including an early onset with possible incomplete penetrance, an atypical glycosylation pattern of PrPSc and, most strikingly, poor transmissibility to Tg(HuPrP) mice, all of which underscore a key role for residue 114 in prion conformation and propagation. Histopathology and immunohistochemistry (IHC) of formalin-fixed, formic acid–treated brain tissue were performed, as described previously.10 Hematoxylin and eosin staining was performed on 5-μm sections, whereas IHC to PrP and glial fibrillary acidic protein (GFAP) was performed on 8-μm sections. Each section was deparaffinized, rehydrated, and immersed in tris-buffered saline with Tween 20 before incubation with the EnVision Flex Peroxidase Blocking Reagent (Dako). For PrP immunostaining, sections were incubated with hydrochloric acid (1.5 mmol/L) and microwaved for 15 minutes, probed with monoclonal antibodies (mAb) 3F4 (1:1,000)11 or GFAP (1:20,000) (Sigma-Aldrich) for 60 minutes, and then washed and incubated with Envision Flex/horseradish polymerase polymer for 30 minutes (Dako) before visualization of the immunoreactivity with Envision Flex 3,3′-diaminobenzidine tetrahydrochloride (Dako). Western blot (WB) analysis was performed as previously described.10 Briefly, a 10% (wt/vol) brain homogenate (BH) was prepared in lysis buffer (100 mM NaCl, 10 mM EDTA, 0.5% NP-40, 0.5% sodium deoxycholate, 10 mM Tris, pH 7.4) or in lysis buffer with 100 mM Tris (100 mM NaCl, 10 mM EDTA, 0.5% NP-40, 0.5% sodium deoxycholate, 100 mM Tris, pH 8.0) and incubated for 1 hour at 37°C with 20 or 100 μg/mL of PK (Sigma-Aldrich), followed by termination of the reaction with 2 mM phenylmethylsulfonyl fluoride (Sigma-Aldrich). Samples were then diluted 1:1 with 2X Laemmli sample buffer (Bio-Rad) and denatured at 100°C for 10 minutes prior loading onto 12%, 14%, or 15% polyacrylamide gels. For experiments with PMCA, aliquots of “PMCA+” and “PMCA−” (see below) were incubated with either 100 or 50 μg/ml PK, depending on whether Tg(HuPrP) or Tg(HuPrPGlyKO) was used as the substrate. Incubation with PK was performed at 40°C for 60 minutes with shaking. After denaturation (at 100°C for 10 minutes), samples were precipitated with prechilled methanol (1:10 dilution) sonicated, and loaded onto a 15% Tris-Glycine precast gel (Bio-Rad). Proteins were transferred to polyvinylidene difluoride membranes, probed with mAb 3F4 for 2 hours at 1:40,000 dilution12 followed by incubation with a horseradish peroxidase–conjugated goat antimouse secondary Ab for 1 hour at 1:3,000 dilution. After incubation with a chemiluminescence substrate (Pierce or Amersham Biosciences), signal was recorded with a Bio-Rad XRS digital document imager or visualized on Kodak films. BH from 2 distinct Tg mouse models were used as the substrate in PMCA. Tg(HuPrP) mice are hemizygous for human PrPC, which expresses PrPC with methionine (M) at codon 129 (i.e., PrPC-129M) on a PrPC null background (PrP−/−), at ∼8 × normal level of PrPC.13 The TgNN6h line, hereafter designated Tg(HuPrPGlyKO), expresses human PrPC with 2 point mutations that eliminate 2 N-linked glycosylation sites on human PrPC (codons 181 and 197), in which asparagine (N) is replaced by glutamine (Q) (PrP-N181Q/N197Q).14 These mice are homozygous for the transgene that is expressed at ∼0.6-fold that of normal mouse brain PrP levels. Brains harvested from 1.5-month-old healthy Tg mice were perfused with 5 mM EDTA in 1X Dulbecco phosphate-buffered saline (1X DPBS). Ten percent normal BH was prepared in conversion buffer (150 mM NaCl, 1% Triton X-100, 1X Protease Inhibitor Cocktail in 1X DPBS) and centrifuged at 800 × g at 4°C for 1 minute. The collected supernatants (hereafter designated as NBH) were used as the “substrate” for the PMCA reaction. BH from the frontal cortex of the proband, used as “seed” (hereafter identified as infectious BH or IBH), was prepared following the same procedure used to generate the NBH. PMCA was performed as previously described with few modifications.15 The NBH from Tg(HuPrP) or Tg(HuPrPGlyKO) and IBH from the proband or control cases of sCJD were mixed in a 9:1 ratio in a test tube, in the presence of 0.05% digitonin detergent (Sigma-Aldrich) and one 2.38 mm-diameter polytetrafluoroethylene bead (McMaster-Carr). One aliquot of the NBH-IBH mixture was subjected to PMCA (PMCA+), and one aliquot was stored at −80°C and used as the negative control (PMCA–). PMCA reactions were carried out in a programmable sonicator (Misonix Sonicator S-4000; Misonix Inc, Farmingdale, NY) for a total of 96 cycles of sonication. Each cycle consisted of 30 seconds of sonication (Amplitude 98, wattage 230–250) and 29.5 minutes of incubation at 37°C. Human-related studies were conducted under an approved University of Chicago Institutional Review Board protocol (#9713), and animal studies were performed under an approved University of Chicago Institutional Animal Care and Use Committee approval of protocol (#70735). DNA was extracted from whole blood, and the entire coding segment of the PRNP gene was amplified by PCR using previously reported primers10 and bidirectional sequencing using an automated sequencer. Fresh-frozen brain from the frontal cortex was homogenized in 1X phosphate buffered saline to a final concentration of 1%, as previously described.16 Tg mice expressing human PrPC with Met coding at residue 129 on a mouse PrP knock-out background (i.e., Tg[HuPrP-129M]Prnpo/o) were previously constructed and described elsewhere.13 Mice were anesthetized with a xylazine/ketamine mixture, the head fixed in a small animal stereotaxic instrument (Kopf) and intracerebrally inoculated with BH, directly through the scalp, as described previously.13 Typical symptoms of prion disease in mice, including reduced spontaneous movement, scruffy coat, hunched back, and progressively unsteady gait, were monitored every other day. When symptomatic and near-terminal, mice were killed and their brains harvested, freshly hemisectioned, half frozen in dry ice, and half fixed in 2% formalin. All mouse studies were approved by the Institutional Animal Care and Use Committee before study. A 24-year-old right-handed white man with no known medical history except for a mild learning disability developed general and episodic anxiety, intermittent confusion, fatigue, memory impairment, and slurred speech ∼1 year before seeking medical attention. Initial neurologic evaluation demonstrated mild hypomimia, finger agnosia, and fine bilateral hand tremor. A neuropsychological battery revealed a full-scale IQ of 73, impaired attention, concentration, memory, and mild-to-moderate executive dysfunction. An EEG showed paroxysmal diffuse 4–5 Hz slow activity, with occasional sharp wave–like morphology. An extensive workup included routine laboratory tests for dementia, in addition to antithyroid antibodies, a paraneoplastic panel that included NMDA and GAD65 antibodies, amino acid profile, and heavy metal testing, all of which were negative. CSF cell count, glucose, protein, angiotensin converting enzyme level, VDRL, Lyme PCR, total tau, phosphorylated tau, Aβ42, and 14-3-3 protein were within normal range or negative, as was bacterial, acid-fast bacilli, and fungal cultures. Brain MRI was reported as normal. Over the next year, he became more withdrawn, declined cognitively, developed progressive clumsiness, prominent word-finding difficulty, and slowed motor skills that led to 3 car accidents. At the time, he had a coarse hand and head tremor, cogwheel rigidity of the limbs, stooped posture, and a mildly spastic gait with impaired arm swing. He scored 20 of 30 on the Mini-Mental State Examination.17 Fluorodeoxyglucose PET exhibited decreased but symmetric cortical metabolism, more pronounced in the posterior parietal, temporal, and occipital regions, while thalamic uptake was similar to the cortex, and there was a relative increase in metabolic activity in the basal ganglia. 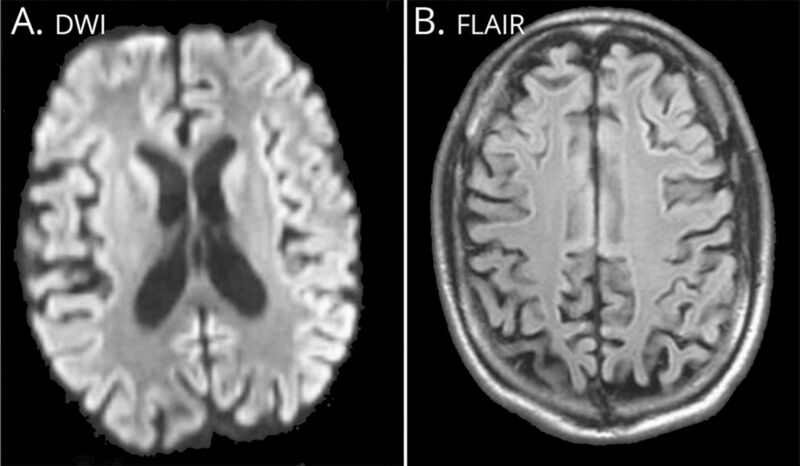 Diffusion-weighted imaging (DWI) sequences on MRI displayed restricted diffusion throughout the cortical ribbon, and right, greater than left, cortical atrophy (figure 1, A and B). Over the next 2 years, the patient developed global aphasia, choreiform movements and myoclonus of the upper extremities, increased axial rigidity, and severe gait ataxia, ultimately confining him to a wheelchair and eventual death 5 years from the initial onset of symptoms, at age 29 years. (A) DWI sequence shows restricted diffusion throughout the cortical ribbon and within the caudate nuclei. (B) FLAIR sequence shows diffuse cortical atrophy. DWI = diffusion-weighted imaging; FLAIR = fluid-attenuated inversion recovery. The proband's father suffered a similar course, beginning at age 32 years, with progressive cognitive decline and prominent aphasia that progressed to mutism, in addition to visual hallucinations, gait ataxia, postural instability, and generalized myoclonus. The brain MRI report noted “diffuse cerebral atrophy, markedly out of proportion for age,” but films were not available for review. He died at age 34 and underwent brain autopsy, although PRNP gene sequencing was not performed at the time. Tissue was unavailable for genetic testing, but limited fixed tissue was available for histologic staining. Widespread spongiform degeneration (SD) and gliosis were most severe in the frontal (figure 2A), temporal, and parietal cotices, and least severe in the occipital lobe and hippocampus (figure 2, B and C). Severe SD was also present within the putamen (figure 2D), but not the adjacent globus pallidus, and within the medial nuclei of the thalamus, but not the lateral thalamus (not shown). The midbrain, cerebellum (figure 2, E and F), pons, and medulla were also devoid of SD (not shown). IHC with anti-PrP mAb 3F4 revealed fine, diffuse PrP staining and occasionally larger granules within the cerebral cortex (figure 2, M–O) and neostriatum (figure 2P), as well as plaque-like PrP deposits in the putamen and cerebellum (figure 2, P and Q). IHC for GFAP in frontal and temporal lobes revealed intense reactive astrogliosis (figure 2R). (A–L) Hematoxylin and eosin (H&E) staining of the proband (A–F) and proband's father (G–L). (A–D) Severe spongiform degeneration (SD) affecting frontal lobe (A) and putamen (D), and mild SD in the occipital lobe (B) and CA1 region of the hippocampus (C). (E–F) No SD affecting the midbrain (E) and cerebellum (F). (G, H, J) Severe SD affecting the frontal lobe (G), and mild SD in the parietal lobe (H) and putamen (J). (I, K–L) No SD affecting the hippocampus (I), midbrain (K), and cerebellum (L). Arrows in B, C, and J indicate SD. (M–Q) PrP immunostaining of the proband. (M and N) Diffuse PrP staining affecting the frontal lobe (M) and subiculum (N); the arrow in (N) indicates a cluster of larger PrP granules of different size. (O) Intense PrP staining at the interface between the dentate gyrus and Ammon horn (arrows); the inset depicts a high magnification of the area outlined by the dashed rectangle. (P and Q) Plaque-like PrP immunostaining in the putamen (P) and cerebellum (Q); antibody: 3F4. (R) Intense gliosis (arrow) affecting the temporal cortex; antibody: GFAP. In a limited number of sections from the proband's father, SD was observed within the cerebral cortex and putamen (figure 2, G, H, and J), with sparing of the hippocampus, midbrain, pons, medulla, and cerebellum (figure 2, I, K, and L). Sequencing the entire coding segment of the PRNP gene of the proband revealed a heterozygous thymine substitution of guanine at the second nucleotide of codon 114 (c.341G>T), resulting in a change in coding from glycine (G) to valine (V) (G114V) (figure 3A). The polymorphic codon 129, which is known to confer susceptibility to prion disease, modify disease phenotype, and influence the conformation of PrPSc, was homozygous for methionine (129MM) (figure 3). No other alterations were detected. 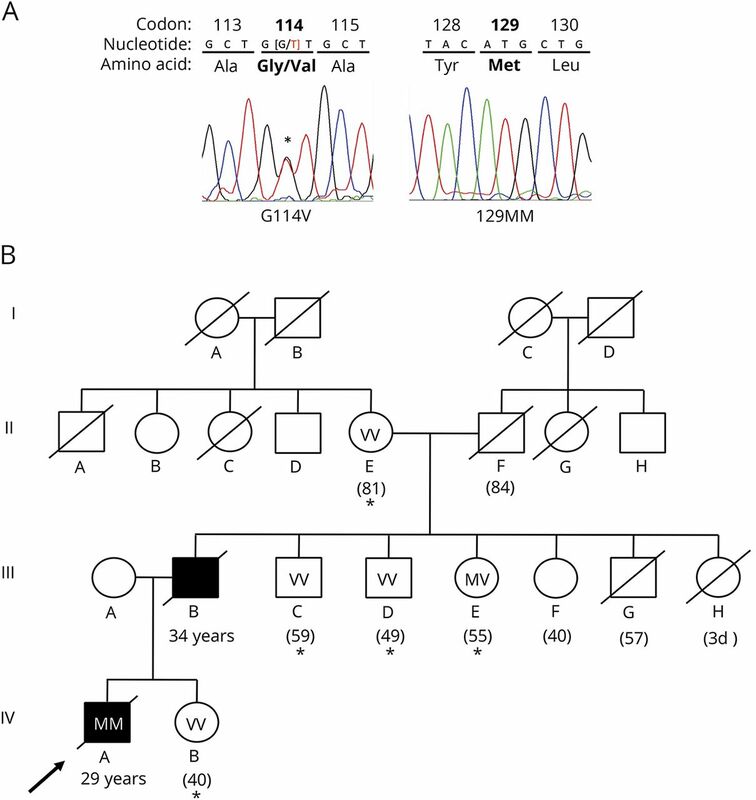 Although no genetic information was available from the proband's father, based on the early age at disease onset and similarity of the presentation, we assumed that he carried the same PRNP-G114V variant. A pedigree was constructed, based on information provided by family members (figure 3B). The paternal grandmother (II-E) was alive at 81, although the paternal grandfather reportedly died without dementia at age 84 years and none of the father's 6 siblings, aged 40–59 years, developed a progressive neurologic disorder. A paternal uncle died of cancer at age 57 years (III-G) and an aunt died 3 days after birth (IIIH). We sequenced the coding segment of the PRNP gene of 5 unaffected family members, including the paternal grandmother (II-E), 3 of his father's siblings (III-C, D, and E) and the proband's sister (IV-B). None carried the G114V variant, and the polymorphic codon 129 genotype was homozygous for Val (129VV) in 4 members (II-E, III-C, III-D, and IV-B) and 129MV in 1 (III-E). Since the paternal grandmother (II-E) was 129VV and the G114V change is on the 129M allele, the grandfather would be predicted to have a 129MV genotype and be a silent carrier of G114V on the 129M allele. However, surprisingly, the genotype of the proband's aunt (III-E) was 129MV with a normal 129M allele. (A) Chromatogram segments of the PRNP gene sequences surrounding the codon 114 sequence alteration (*) and the polymorphic codon 129. A guanine (G) to thymine (T) change at the second nucleotide of codon 114, resulting in a valine (V) substitution for glycine (G) at residue 114 of PrP. The polymorphic codon 129 was homozygous for methionine (Met). (B) Pedigree of the gCJDG114V family. The proband (IV-A) and his father (III-B) exhibited progressive dementia at young ages. Sequencing of the PRNP gene of the proband (arrow) revealed the G114V variant. DNA from the proband's father was not available. No other family members were reportedly affected. Sequencing was performed on individuals marked with an asterisk, although none carried the G114V variant. The polymorphic codon 129 status is represented within each symbol. V = valine, M = methionine. Numbers below symbols represent the age at death or at the time of genetic testing. Square = male; circle = female; slash = deceased; filled symbol = affected individual. The PrPSc conformation enciphers the clinicopathologic phenotype of prion disease.16,18 The gel mobility of resPrPSc is an indirect measure of the PrPSc conformation. Although easily detected by WB within each brain region tested, the level of resPrPSc varied from highest in the parietal cortex to lowest in the cerebellum (figure 4A). In contrast to the typical resPrPSc of sCJD, resPrPSc from gCJDG114V lacked the diglycosylated band, exhibiting only prominent monoglycosylated, and less prominent unglycosylated, resPrPSc bands. In addition, compared with the ∼21 kDa gel mobility of unglycosylated resPrPSc from all other brain regions, initial WB of resPrPSc from the frontal lobe showed a gel mobility of ∼19 kDa, matching that of PrPSc type 2 (figure 4A). Following multiple extended electrophoretic runs, a doublet was revealed, supporting the coexistence of PrPSc types 1 and 2 in the frontal cortex (figure 4B).19 These findings were independently replicated at the University of Chicago and Case Western Reserve University. (A) WB prepared from brain homogenates (BHs) of the proband and control patient with sCJDMM1 probed with mAb 3F4. Equal total protein loads compare several brain regions with a case of sCJDMM1 before (top) and after (bottom) proteinase K (PK) digestion to reveal PK-resistant PrPSc (resPrPSc). The electrophoretic profile of untreated samples from gCJDG114V and sCJDMM1 appeared similar, although after digestion, all samples from the proband lacked the diglycosylated band. The parietal lobe carried the highest level of resPrPSc. (B) WB showing coexisting resPrPSc types 1 and 2 in the frontal cortex (FC; lane 3), and type 1 in the occipital cortex (OC; lane 4) of gCJDG114V, compared with resPrPSc type 1 (lane 1) and type 2 (lane 2) from sCJDMM1 and sCJDMM2, respectively. (C) Survival times (days) of Tg(HuPrP-129M) mice following intracerebral inoculation of 30 μL of 1% frontal cortex BH from the gCJDG114V proband compared with sCJDMM1 (n = 6 mice per group). One mouse inoculated with gCJDG114V was killed 600 days after inoculation because of signs of aging, although the remainder were healthy and without symptoms after nearly 700 days when they were killed. All Tg(HuPrP-129M) mice inoculated with sCJDMM1 died with signs of prion disease (rough coat, hunched back, and unsteady gait) at 161.7 ± 4.0 days. (D) WB of representative mouse brain samples confirming the absence of resPrPSc in mice inoculated with gCJDG114V compared with the high level of resPrPSc in mice inoculated with sCJDMM1. Previous work shows that sequence homology between PrPSc and PrPC at critical sites within PrP, especially at the polymorphic residue 129, is known to affect the efficiency of transmission.5,20 As such, we used Tg(HuPrP-129M) mice that express human PrP with Met at residue 129, to match the 129 coding of the proband. Surprisingly, after nearly 700 days following intracerebral inoculation with BH from the proband, no clinical signs of disease or histopathologic changes (not shown) were evident, whereas control Tg(HuPrP-129M) mice inoculated with BH prepared from a case of sCJDMM1 yielded efficient transmission after 161.7 ± 4.0 days (figure 4C). 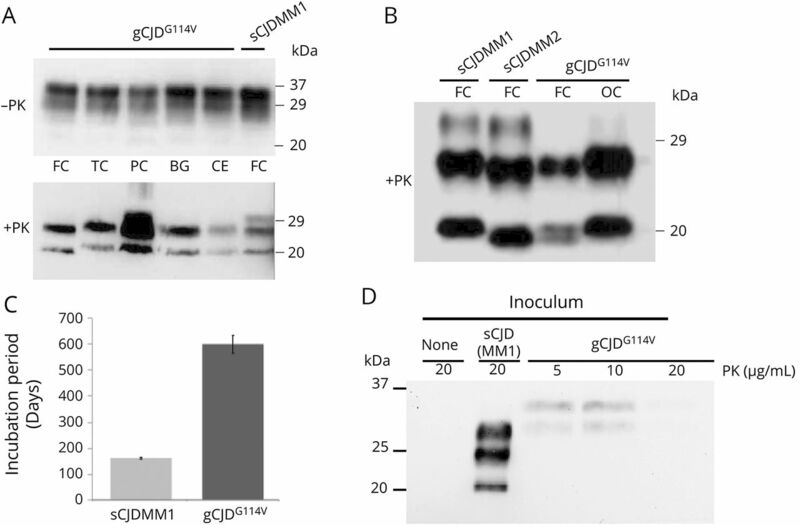 WB prepared from inoculated mice revealed no resPrPSc from mice inoculated with gCJDG114V compared with robust levels of resPrPSc type 1 in mice inoculated with sCJDMM1 (figure 4D). We wondered whether propagation of PrPSc from gCJDG114V could be demonstrated using PMCA because this technique allows for a more controlled setting that might enhance prion propagation. BH from healthy Tg(HuPrP-129M) and Tg(HuPrPGlyKO) mice was used as the substrate in separate reactions with PrPSc from the proband as the seed. The proband's resPrPSc prepared in conversion buffer and not subjected to PMCA confirmed the presence, under these conditions, of mixed PrPSc types 1 and 2 lacking the diglycosylated fraction (figure 5A). PMCA reactions using Tg(HuPrP) as substrate amplified PrPSc type 2, but not type 1. Only monoglycosylated and nonglycosylated bands were present, confirming the absence of a diglycosylated seed. Preferential PrPSc type 2 amplification was also observed using BH from Tg(HuPrPGlyKO) mice that express a mutated form of human PrP that lacks N-linked sugar chains at residues 181 and 197 (figure 5A). As the control, PrPSc from sCJDMM1, with all glycoforms, was robustly amplified using Tg(HuPrP) brain as the PrPC substrate (figure 5B). Brain homogenates prepared from the frontal cortex of gCJDG114V and sCJDMM1 were used to seed the conversion of PrPC into PrPSc. (A) After PMCA (+), the ∼19-kDa PK-resistant PrPSc (resPrPSc) fraction (*) from gCJDG114V, but not ∼21-kDa resPrPSc (**), was amplified using PrPC from the Tg(HuPrP) or Tg(HuPrPGlyKO) mouse brain. Sporadic CJDMM1 and sCJDMM2 controls were loaded for typing purposes. (B) After PMCA (+), PrPSc from sCJDMM1 was efficiently amplified using PrPC from Tg(HuPrP) as the substrate. PMCA (−) refers to the same samples that were not subjected to PMCA reaction. The mAb 3F4 was used to probe immunoblots. Similar results were obtained from 3 independent PMCA reactions. We report the clinicopathologic, molecular, and transmissible properties of gCJDG114V in an American-born individual of Polish descent, with no known linkage to either of the 2 previously reported families from China and Uruguay.8,9 Although the proband and his father had a generally similar course that included progressive dementia and aphasia, disease onset in the proband was marked by behavioral change, primarily anxiety attacks, followed by extrapyramidal features, myoclonus, and generalized ataxia. A similar course, with behavioral changes, was described for most of the 5 affected members of the Uruguayan family, although ataxia was not a feature. Ataxia was also not described in the Chinese family, although aphasia was reported. DWI imaging of our proband revealed widespread cortical and caudate hyperintensities, although CSF 14-3-3 protein was negative. A similar pattern of widespread DWI hyperintensity and negative CSF 14-3-3 protein was noted in the Chinese family proband, although neither of these studies were provided in the Uruguayan family report. The early onset of our proband and his father compare well with onsets ranging from 18 to 45 years in the earlier reported families. Despite the early onset of disease, which suggests high penetrance, 45- and 61-year-old asymptomatic carriers of the G114V variant of PRNP were reported in the Uruguayan and Chinese families, which suggests incomplete or variable penetrance. Although our proband and his father were the only 2 affected family members, the G114V variant was not detected in other members sampled, which limits our ability to comment on penetrance. Based on the codon 129 genotypes, we suggest that the sequence alteration could have either arisen de novo in the paternal grandfather's germline or that a nonpaternity event skewed the genetics of this pedigree. However, the typically early onset and the lack of disease in previous generations raise questions whether anticipation or, more likely, other genetic or environmental factors play a significant role in disease manifestation linked to this genetic variant. The gel mobility of resPrPSc is an indirect measure of PrPSc conformation, which differs among the major subtypes of prion disease.2,28 The gel migration pattern of CJD-derived resPrPSc typically includes 3 glycoforms that range from ∼19 or 21 to 30 kDa, whereas GSS-associated resPrPSc has a single nonglycosylated band of 7–16 kDa, representing N- and C-terminally cleaved PrPSc. The resPrPSc associated with A133V has not been reported, but that from A117V,29,30 S132I,22 and G131V24 conforms to the GSS pattern. That from our proband migrates more characteristically as CJD, despite the absence of the diglycosylated fraction. Of interest, a similar pattern has been reported with the T183A,31 V180I,32 and P105S10 variants and in a single case of sCJD.33 Although the sequence changes at residues 180 and 183 could directly interfere with nearby N-linked glycosylation sites at residue 181, the distal location of residues 105 and 114, and the occurrence of this resPrPSc type in a sCJD case, suggests that the conformation of this rare PrPSc type favors selection of the unglycosylated and monoglycosylated PrPSc isoforms. Although we also found a mixture of ∼19- and ∼21-kDa resPrPSc in our proband, this feature has been reported in as many as ∼40% of sCJD cases with the 129MM genotype19 and in rare cases of gCJDE200K 34 and gCJDD178N.35 Overall, the clinicopathologic and molecular typing characteristics best suggest that the PRNP-G114V variant should be categorized as a CJD subtype. The lack of transmission of gCJDG114V to TgHuPrP mice implies that the sequence change at residue 114 introduces a barrier to transmission. Efficient prion transmission has been shown to depend on the balance of two critical determinants: (1) sequence homology between PrPSc and PrPC at key sites of association within the PrPSc-PrPC interface and (2) the ability of PrPC to acquire the conformation of PrPSc. We can speculate that the sequence alteration at residue 114 that sits within the highly conserved palindrome represents a mismatch at an association site within the PrPSc-PrPC interface or the conformation of PrPSc induced by the G114V variant falls outside the conformational repertoire that PrPC in TgHuPrP mice can adopt. Although data are limited regarding the transmissibility of disease resulting from other variants within the palindromic region, we have not had success transmitting GSSA117V to Tg(HuPrP) mice (unpublished observations). Whether this relates to a universal feature of GSS to poorly transmit disease compared with CJD36,37 or the sequence mismatch at residue 117, was addressed by 1 group that successfully transmitted GSSA117V to a Tg mouse expressing the homologous sequence change.38 In addition, a more recent study found that bank voles are susceptible to GSS prions, suggesting that the sequence of bank vole PrPC can adopt the conformation of PrPSc in GSSA117V despite the absence of homology at residue 117 between PrPSc and PrPC.39 Thus, the conformation of PrPSc linked to the PRNP-G114V variant may, in fact, be the principal barrier to transmission. The finding that PMCA amplification of this conformation was possible suggests that conditions of this artificial system are more favorable for the PrPSc-PrPC association that leads to propagation of PrPSc. However, despite the partially positive results, a conformational barrier to prion propagation was still evident, based on the selective amplification of the 19-kDa resPrPSc fraction. Recent work suggests that in the presence of 2 conformational subtypes of PrPSc, PMCA favors amplification of the least stable conformer,14 which is suggested to be the 19-kDa PrPSc fraction in this case, based on its limited presence within the frontal lobes, compared with the widespread presence of the 21-kDa conformer. Our findings demonstrate that the G114V variant of PRNP promotes a CJD clinicopathologic phenotype linked to an atypical PrPSc conformation that lacks the diglycosylated fraction and is poorly transmissible to Tg(HuPrP) mice. Although the G114V variant of PRNP appears to be associated with variable penetrance that is not yet well characterized, its location within the highly conserved palindromic segment of the hydrophobic core of PrP and the associated atypical conformation of PrPSc are likely to contribute to the unique properties of gCJDG114V prions that we observed. Overall, these findings highlight the importance of this residue and the palindrome in prion conformation and propagation and as a potential target of therapy. I. Cali: histologic preparations, data interpretation, and generation of figures and text for manuscript preparation. K. Qin: preparation of Western blots, interpretation of data, and assistance with text preparation. F. Mikhail: patient data acquisition, preparation of figures, and manuscript writing. A. Solanki: breeding and maintenance of mice and inoculation and monitoring of mice for transmission studies. M.C. Martinez: performed PMCA. L. Zhao: mouse screening and gene sequencing of family members and transgenic mice. C. Gregory: preparation of Western blots, collection of blood samples from subjects, preparation of inoculums, and inoculation of mice for transmission studies. P. Gambetti: histologic studies, data interpretation, and manuscript preparation. E. Norstorm: preparation of figures, data assessment, and manuscript writing. J.A. Mastrianni: design of the study, interpretation of data, and manuscript preparation. B. Appleby: tissue samples and personnel resources. This work was supported by an endowment from the Brain Research Foundation (J.A.M. ), NIH P01AI106705, NIH 5R01NS083687, and Charles S. Britton Fund (P.G. ); The National Prion Disease Pathology Surveillance Center. I. Cali serves as an editorial board member of the World Journal of Neurology, BioMed International, and the Asian Journal of Neuroscience. K. Qin reports no disclosures. F. Mikhail has received research funding from the NRSA T32 Ruth Kirschstein Training Grant. C. Gregory, A. Solanki, M.C. Martinez, and L. Zhao report no disclosures. P. Gambetti has served on the scientific advisory board of Ferring Pharmaceuticals; holds a patent for Sant Cruz BioTechnology (A2006-03237); and has received research funding from the NIH. E. Norstrom reports no disclosures. J.A. Mastrianni has served on the scientific advisory board of the Alzheimer's Association; has consulted for CVS Caremark and the Federal Trade Commission; has received commercial research funding from Eli Lilly and the CMS and Alzheimer's Association; and has received research funding from the Brain Research Foundation. Full disclosure form information provided by the authors is available with the full text of this article at Neurology.org/NG.
. Prions (Les Prix Nobel Lecture). In: Frängsmyr T, editor. Les Prix Nobel. Stockholm: Almqvist & Wiksell International; 1998:268–323.
. The prion diseases. J Geriatr Psychiatry Neurol 2010;23:277–298.
. Molecular basis of phenotypic variability in sporadic Creutzfeldt-Jakob disease. Ann Neurol 1996;39:767–778.
. Mouse models for studying the formation and propagation of prions. J Biol Chem 2014;289:19841–19849.
. Live cell fluorescence resonance energy transfer predicts an altered molecular association of heterologous PrPSc with PrPC. J Biol Chem 2010;285:8967–8975.
. Crossing the species barrier by PrP(Sc) replication in vitro generates unique infectious prions. Cell 2008;134:757–768.
. The application of in vitro cell-free conversion systems to human prion diseases. Acta Neuropathol 2011;121:135–143.
. Human prion disease with a G114V mutation and epidemiological studies in a Chinese family: a case series. J Med Case Rep 2008;2:331.
. A novel mutation (G114V) in the prion protein gene in a family with inherited prion disease. Neurology 2005;64:1455–1457.
. A novel PRNP-P105S mutation associated with atypical prion disease and a rare PrPSc conformation. Neurology 2008;71:1431–1438.
. Mouse polyclonal and monoclonal antibody to scrapie-associated fibril proteins. J Virol 1987;61:3688–3693.
. Variably protease-sensitive prionopathy: a new sporadic disease of the prion protein. Ann Neurol 2010;68:162–172.
. Prion propagation in mice expressing human and chimeric PrP transgenes implicates the interaction of cellular PrP with another protein. Cell 1995;83:79–90.
. Co-existence of distinct prion types enables conformational evolution of human PrPSc by competitive selection. J Biol Chem 2013;288:29846–29861.
. Protein misfolding cyclic amplification for diagnosis and prion propagation studies. Methods Enzymol 2006;412:3–21.
. Prion protein conformation in a patient with sporadic fatal insomnia. N Engl J Med 1999;340:1630–1638.
. “Mini-mental status”: a practical method for grading the cognitive state of patients for the clinician. J Psychiatr Res 1975;12:189–198.
. Evidence for the conformation of the pathologic isoform of the prion protein enciphering and propagating prion diversity. Science 1996;274:2079–2082.
. Co-existence of scrapie prion protein types 1 and 2 in sporadic Creutzfeldt-Jakob disease: its effect on the phenotype and prion-type characteristics. Brain 2009;132:2643–2658.
. Human prion protein with valine 129 prevents expression of variant CJD phenotype. Science 2004;306:1793–1796.
. The AGAAAAGA palindrome in PrP is required to generate a productive PrPSc-PrPC complex that leads to prion propagation. J Biol Chem 2005;280:27236–27243.
. Familial prion disease with a novel serine to isoleucine mutation at codon 132 of prion protein gene (PRNP). Neuropathol Appl Neurobiol 2009;35:111–115.
. A new PRNP mutation (G131V) associated with Gerstmann-Straussler-Scheinker disease. Arch Neurol 2001;58:1899–1902.
. A second case of Gerstmann-Straussler-Scheinker disease linked to the G131V mutation in the prion protein gene in a Dutch patient. J Neuropathol Exp Neurol 2011;70:698–702.
. Inherited prion disease with A117V mutation of the prion protein gene: a novel Hungarian family. J Neurol Neurosurg Psychiatry 2001;70:802–805.
. Prion disease (PrP-A117V) presenting with ataxia instead of dementia. Neurology 1995;45:2042–2050.
. Gerstmann-Straussler-Scheinker disease and the French-Alsatian A117V variant. Clin Exp Pathol 1999;47:161–175.
. Classification of sporadic Creutzfeldt-Jakob disease based on molecular and phenotypic analysis of 300 subjects. Ann Neurol 1999;46:224–233.
. A new transgenic mouse model of Gerstmann-Straussler-Scheinker syndrome caused by the A117V mutation of PRNP. J Neurosci 2009;29:10072–10080.
. A 7-kDa prion protein (PrP) fragment, an integral component of the PrP region required for infectivity, is the major amyloid protein in Gerstmann-Straussler-Scheinker disease A117V. J Biol Chem 2001;276:6009–6015.
. Loss of glycosylation associated with the T183A mutation in human prion disease. Acta Neuropathol (Berl) 2004;108:476–484.
. V180I mutation of the prion protein gene associated with atypical PrPSc glycosylation. Neurosci Lett 2006;408:165–169.
. 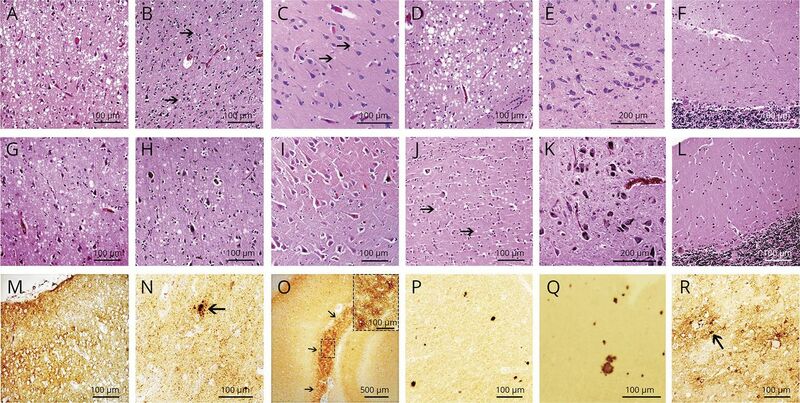 Novel prion protein conformation and glycotype in Creutzfeldt-Jakob disease. Arch Neurol 2007;64:595–599.
. Genetic Creutzfeldt-Jakob disease associated with the E200K mutation: characterization of a complex proteinopathy. Acta Neuropathol 2011;121:39–57.
. Striking PrPsc heterogeneity in inherited prion diseases with the D178N mutation. Ann Neurol 2004;56:909–910. author reply 10–11.
. Human spongiform encephalopathy: the National Institutes of Health series of 300 cases of experimentally transmitted disease. Ann Neurol 1994;35:513–529.
. Experimental transmission of Creutzfeldt-Jakob disease and related diseases to rodents. Neurology 1996;46:532–537.
. Inherited prion disease A117V is not simply a proteinopathy but produces prions transmissible to transgenic mice expressing homologous prion protein. PLoS Pathog 2013;9:e1003643.
. Gerstmann-Straussler-Scheinker disease subtypes efficiently transmit in bank voles as genuine prion diseases. Sci Rep 2016;6:20443.